How To: Making Stock Soups, sauces, gravies and more start here. Soups, sauces, gravies and more start here. 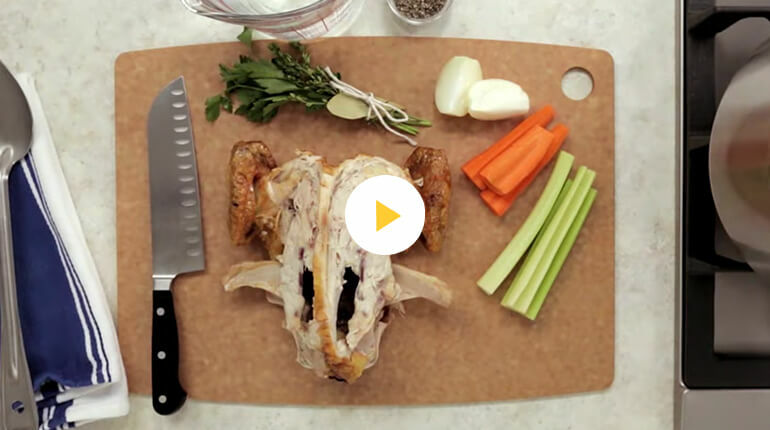 Start a stock with a leftover carcass or roasted parts or pieces. Tired, wilted veggies are perfect for stock — celery, carrots, onions, garlic and herbs. Simmer uncovered for 3 to 4 hours. Occasionally skim off excess fat. If level gets low, add more water. If using a slow cooker, cover and set on low 8 to 10 hours. Line a colander with cheesecloth. Set it over a large bowl or pot and strain the stock. Cool to room temperature. Cover and store the stock overnight in the refrigerator. The remaining fat will congeal and rise to the surface; skim it off and dispose of it. Ladle stock into ice cube trays and freeze for easy use. 1-ounce cubes defrost much more quickly than stock frozen in bulk.